Blown Fiberglass Insulation For The Midlands Residents | We Install Blown Fiberglass Insulation | Is Blown Fiberglass Insulation Right For Your Home? One of the most affordable ways to improve energy efficiency and save money on heating and cooling. Typical attic insulation upgrades can be completed within a single day. Blowing equipment minimizes foot traffic and disruption in your living space. In most cases, can be installed directly over existing attic insulation (underperforming). No hazardous fumes or outgassing. A “once-and-done” cost-saving home improvement that requires no maintenance and never wears out. 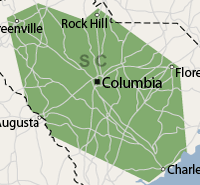 Many South Carolina houses have comfort and energy problems because of inadequate insulation. For example, some rooms are either too hot or too cold at certain times of the year, even when other parts of the house are comfortable. Along with these comfort issues, utility bills are much higher than you’d like them to be. The attic is usually the first home improvement priority for homeowners who want a higher level of comfort and lower utility bills. Most attics only contain a minimal amount of insulation -- not nearly enough to cope with today’s extreme temperatures and high energy costs. Fortunately, an attic insulation upgrade is one of the most affordable and cost-effective energy upgrades available. By sealing energy-wasting air leaks and upgrading attic insulation according to Dept. of Energy recommendations, you can cut your heating and cooling costs nearly in half. Schedule a consulation for blown fiberglass insulation today! Blown fiberglass insulation is very similar to the fiberglass insulation manufactured as rolls or batts. It comes in densely packed bales that are wrapped in plastic. As the name suggests, blown fiberglass is applied with special blowing equipment. One worker feeds insulation into a machine that shreds the fiberglass before blowing it through a long hose. In the attic, another application technician aims the end of the hose, directing the application of shredded fiberglass until the proper depth is attained. New blown fiberglass insulation can usually be applied directly over existing insulation. The end results in a thick, fluffy blanket of high-quality insulation will make a dramatic difference in comfort and HVAC costs. A better blanket. Most houses don’t have enough attic insulation, but blown fiberglass offers a way to remedy this problem once and for all. New insulation can be applied directly over old, using special blowing equipment. Fiberglass insulation slows heat transfer by conduction, but it won’t stop energy losses caused by air leaks. That’s why air sealing should always be done before an insulation upgrade with blown fiberglass. In the attic, technicians will move existing insulation aside in order to seal gaps, cracks and other air leaks, using spray foam and other products. When air sealing is completed, existing insulation is replaced and new blown fiberglass insulation can be added. Dr. Energy Saver is your locally owned home insulation company. We specialize in many areas of insulating the home, as well as installing blown fiberglass insulation. Experience the comfort your home deserves with our home insulation and air sealing services, contact us today to get started!